Delta Electronics, Inc. of Taiwan, recognized as a leading provider of power and thermal management solutions, recently announced the expansion of its R&D and manufacturing operations with new facilities in Bangalore and Hosur, India, respectively. In line with its long-term plans to harness the country's significant long-term growth potential, Delta also plans to develop smart energy management solutions with industry-leading technologies and efficiency at its new R&D center. 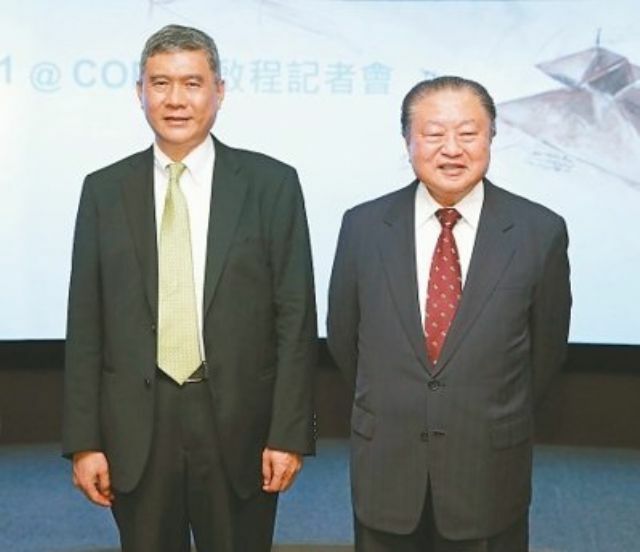 Delta's founder Bruce Cheng (right), and chairman Yancey Hai (photo from UDN). Delta made the above statement at Elecrama 2016, reportedly the biggest showcase of global electrical products and services in India. All senior management of Delta attended the event, including company founder Bruce Cheng, chairman Yancey Hai, president and chief operating officer (COO) Mark Ko, CEO Cheng Ping, etc. Delta had already set up the fully-owned Indian subsidiary Delta India Electronics in 1992. Delta India Electronics India is reportedly the leading supplier of telecom power solutions and a major source of industrial automation, display solutions, UPS, DC fans & blowers and many others, in the Indian market. In 2003, Delta India's revenue was only US$6 million, which has grown to US$170 million by 2015, thanks to many of Delta India's major product categories having gained leadership. The Taiwanese electronics maker pointed out that it has selected Bangalore for its new R&D centre due to the high quality and abundance of the engineering talent pool for software and hardware development. This new R&D centre is expected to create up to 500 tech jobs within the next three years and focus on technologies such as mega-watt scale power conversion and power quality. While the new plant in Hosur is expected to start operations by early 2017 and will supply the local marketplace with smart, high-efficiency telecom power systems, industrial automation solutions, UPS, renewable energy inverters and converters as well as solutions for display and monitoring. Hosur, as a result, will become Delta's largest manufacturing base in India, where Delta's new factory will within the next 10 years create up to 20,000 jobs. Delta showcased various new and innovative products at Elecrama 2016, including advanced solutions for the growing smart manufacturing sector in India. Among them, the SCARA DRS40L series robotic arm solution, which can be easily integrated in production lines for electronics manufacturing, packaging, rubber and plastic applications, such as assembly, soldering, inspection, insertion, screw locking, etc., with triple increase in productivity in certain cases. Another highlight of Delta's offering at Elecrama is the battery energy storage system, a modular cabinet with 41 kWh of energy backup capacity that taps Delta's proprietary lithium-ion battery technology and power conditioning system (PCS). With the use of an energy management system (EMS), this storage platform is suitable for a variety of applications, such as community, commercial energy storage and utility-scale ancillary services. Functions such as output power stabilization for renewable power systems, peak-demand avoidance to reduce exposure to elevated electricity prices and power backup are key elements of this solution.